We were the last to leave our albergue this morning. Avoiding the Camino rush hour was one of the reasons for our later departure and, also, we only intended to walk as far as Hontanas, a distance of 10.8 km. No albergue is ready to accept a new influx of peregrinos until at least noon, so there is no point in arriving earlier. 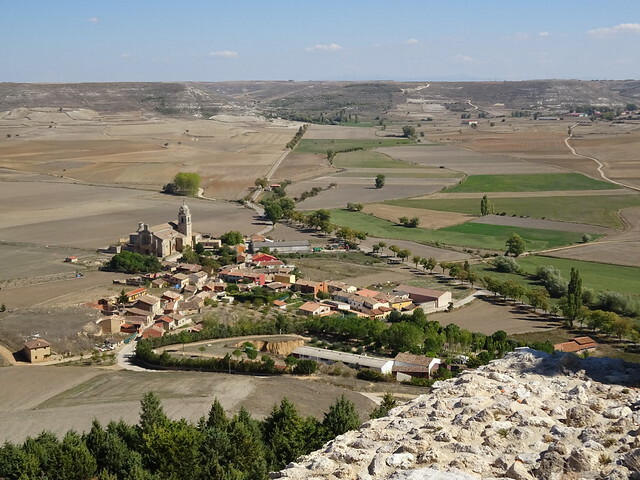 Hontanas is another classic pilgrim village tucked down in a fold in the Meseta. It is a pretty village with brightly coloured window boxes and planters and a fountain that a flock of pigeons were cooing over. One of the first places we came to was the new Juan de Yepes albergue and cafe which would have been a lovely place to stay; however, it wasn’t even 11 o’clock yet, too early to stop walking. Before going another 9.4 km. to Castrojeriz, we had what is becoming a usual breakfast/lunch of potato tortillas. 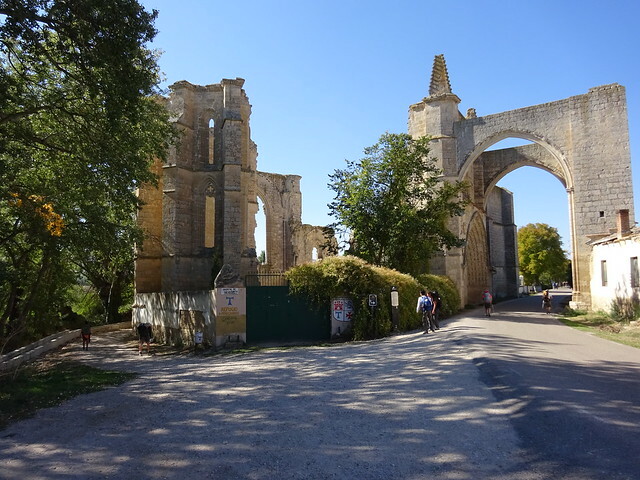 I am sorry to say that since Day 10 there has not been much in the way of an “inner journey” that John Brierley writes about in his Camino guidebook …that is, until today. Anything spiritual is hard to come by when you are distracted by other peregrinos, hear the drone of traffic, or when you are walking through villages and cities. Dave and I had been talking about how walking the Camino was just plain hard work. What on earth are we doing this for? Dave was here to enjoy and photograph nature; I was hoping for that too, but also something spiritual. But this has been more of a physical journey than a spiritual one. My head was down and I was carefully trying to avoid tripping hazards. We aren’t even half way to Santiago and yet we have walked for 22 days! How much harder is it going to get? I felt discouraged but, just when I needed her, my sister Carole urged me on. “You can do this! You can do anything,” she said. “Yes, Carole! I hear you! You are on my shoulder, just like you promised.” I then looked up at the beauty of the rolling hills and how it touches the perfectly blue sky, felt the cool breeze, and there was only silence. I AM GOING TO DO THIS! “Now back to our regular programming!” Just outside Castrojeriz are the 14th century ruins of the ancient monastery of San Antón, run by the Hospital Brothers of St. Anthony. They were dedicated to caring for the sick who came along the Camino de Santiago, especially those with the disease called “St. Anthony’s fire, sacred fire, or fire of the sick” (whatever that is). Currently only the arch that formed a tunnel, through which pilgrims came and went, is left standing. 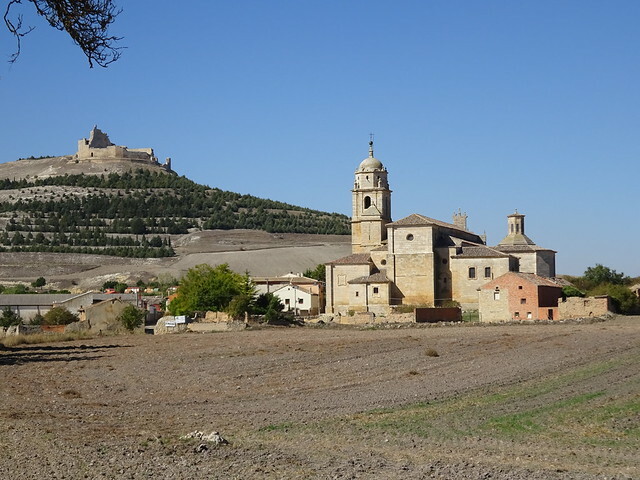 Even after we reached our San Esteban municipal albergue in Castrojeriz, Dave had more walking to do. He always likes to reach the top of the village. 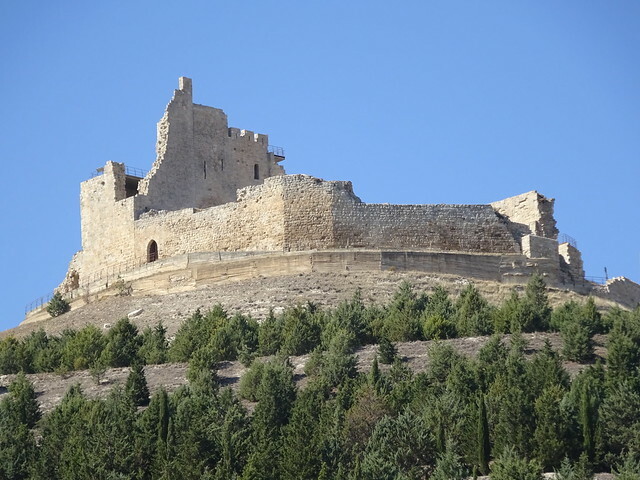 In Castrojeriz it happens to be the ruins of the castle on the top of the hill. The first mention of this castle dates from the 9th century during the skirmishes with the Muslim forces. There are three clearly differentiated sections: the Roman part which is today reduced to an almost hidden square tower; the Visigoth part comprising the extension to the castle with different masonry work from in the Roman part; and the medieval part. 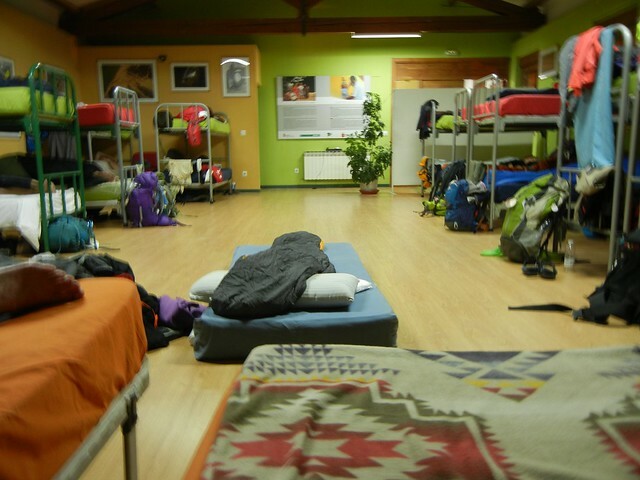 At the San Esteban municipal albergue, we are in a dormitory of 30 – actually 31 due to a latecomer who arrived when all the albergues were full. Rather than turn him away, a mattress on the floor gave him a place to lay his head. This is the spirit of the Camino at its best. P.S. 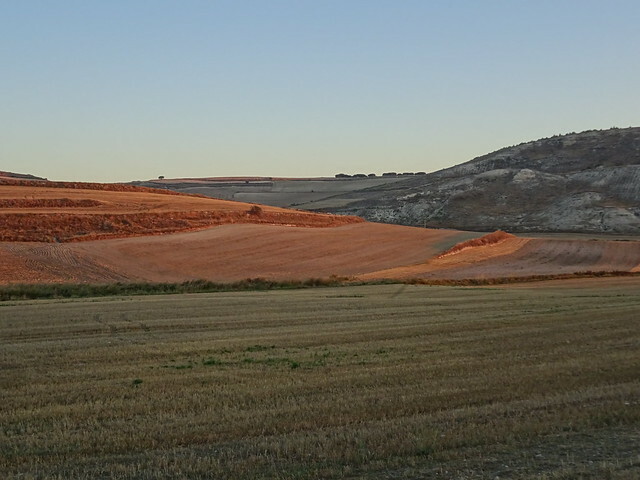 This is our first full day on the Meseta and we couldn’t help but notice that “the call of nature” can be a problem when there are no hiding places where one can carry on their private business (if you catch my drift). There must be an unwritten code of ethics or “manual of politeness” for such times. We slow our pace, look the other way, and allow him/her privacy. We were the last two people checking in and got the two single beds at the window – best beds in the room. Whenever it gets too cold at night, I wear all four merino wool shirts to bed. It’s quite nice in the morning when I don’t have to bother getting dressed because I’m already dressed! LOL!